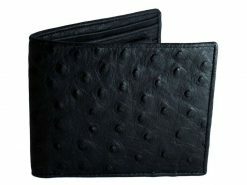 Mens Ostrich Wallet Black Ostrich Skin Wallet. 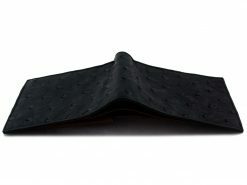 A mens ostrich wallet in mysterious black with a contrasting red ostrich leather interior. 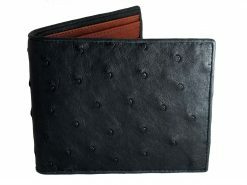 We’ve crafted these original wallets from 2 bands of leather from the ostrich. The “scalloped scales” seen in this example are actually the protective line of scales running down the front of an ostrich’s powerful leg. When on a date it’s always useful to remember that women hate guys that talk themselves up. She’s looking for visual cues to tell her what kind of a guy you are. 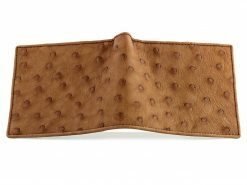 When you pull this exotic wallet out to pay the bill she’ll see that you’re sophisticated and dependable with a touch of fire inside, irresistible. 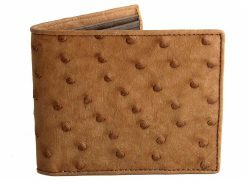 Durable and a real style statement, this mens ostrich leather wallet will get you noticed. 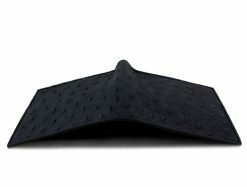 This is by far the finest wallet I’ve ever had. Absolute quality. Beautiful workmanship. Looks even better in person. Slim not bulky. Perfect.